This is our 24 hour high quartz high torque movement. The 24 hours represents military time based on a 24 hour day rather than the normal 12 hour day. This AA battery powered movement has an hour hand that rotates once every 24 hours and a minute hand that rotates once every hour. It will operate hands up to 18” in length. We also have two styrene clock dials made specifically for use with this 24 hour movement. Our new MVT24HRSTEP-HT has the American "I" shaft configuration for the hour, minute and second hands, so this movement will operate any of our standard hands. It has a "stepping" second hand motion for optional second hands. A choice of free hour and minute hands under 5" is included in the movement price. All second hands and hands over 5" are available at an added cost. While this movement is rated as a high torque movement, it is very important that the minute hand of any pair of hands 8" or longer be balanced. Because of the "stepping" second hand motion, we do not recommend that a second hand longer than 5" be used with this movement. We do not recommend using minute hands that are over 12" because this movement does not have as much torque as the rest of our high torque movements, and this movement does not have the "extended minute hand shaft" feature found on our other high torque movements. This can make it difficult to properly align the hands if over 12". FREE CHOICE of over 40 pairs of hour and minute hands under 5” is included. You just have to tell us what you would like. See the link to clock hands at the bottom of the movement page. Please do not assume that any clock hands you have will fit, as the mounting holes are not standardized. Mounting hole sizes and shapes are shown at the top of the clock hands link. If you do not choose a FREE pair of hands with your movement purchase and later decide that you need them, there will be a $5.00 charge for us having to make a second shipment. This 24 hour movement will operate a second hand under 5”, but second hands are considered optional. See the bottom of the movement page for the link to our selection of second hands. 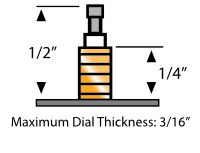 All models have a 5/16" shaft diameter so a 3/8" mounting hole is the correct size to drill in your case. Dimensions: 2-3/16" x 2-3/16" x 5/8"